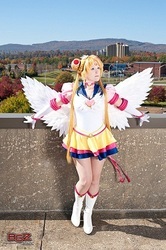 With over a decade of experience, Envel is a cosplayer who comes with quite the knowledge in many facets of cosplay. Crafting since childhood, cosplaying since 2002, competing since 2007, and judging since 2011, she has seen the cosplay hobby inside and out. While her strongest passions lie in sewing and wig-styling, Envel enjoys challenging herself with every aspect of each costume, from custom-made shoes to building props from scratch. From classics like Sailor Moon and Yu-Gi-Oh! to more modern anime like Tokyo Ghoul and Love Love!, Envel's adoration for anime and cosplay continues to grow with each new year; she has even created cosplay tutorials to share her methods and information with others, such as styling drill curls and making the signature glove rolls for Sailor Guardian costumes.